Often my inbox is overflowing - like most of us there’s a constant need to be always on. Late one rainy Sunday afternoon, I was struggling to get through my inbox. Luckily, I didn’t overlook an invite to ride the inaugural Reef to Reef, a four-day MTB stage race in Cairns, Australia. There was only two-weeks from committing to the event and flying to the event, and I needed to get a mountain bike. I know this seems odd, but I was between bikes and didn’t think I’d be needing a XC whippet for a stage race – especially in our bleaker months. My first choice was the new Yeti SB100. This rig has had plenty of hype over the past few months, and I figured 100mm of Yeti’s pedal-friendly Infinity Link suspension, along with a new-skool geometry (a bit slacker than traditional XC race bikes) would be ideal for me and for the event. The bike showed up a day before I was due to leave, so I didn’t even have time to pull it out of the bike bag—let alone ride it. Cairns, which is situated pretty close to the equator, so my hoodie was replaced with a tee-shirt. This is the perfect destination for two-wheeled antics in a not-too-far from home location. Early the first morning, I brewed a quick cuppa’, thought about what may lay ahead, got my s*** sorted and met my riding mate, Andrew Pike (Pikey). A 20km Time Trail was on the menu for stage one, and it would be served at the Smithfield MTB Park, host to various UCI World Cup and World Championship events. The start time was counted down, and Andrew pedalled out 15 seconds in-front of me. We were both in the solo category, and I didn’t really care about placing but wanted to get an upper-hand on Pikey. He, like me, was underdone and this was his first mountain bike stage race as well. The SB100 was at home on the smooth, flowing and lush trails of Smithfield. As I picked up and passed Pikey, I kept pushing the envelope. The elevation gain was off the charts, but that meant the final descent was long, technical, flowing with jumps, berms and the smooth red rainforest dirt held the tyres so well! Crossing the finish line closely, we rocked over to the beer tent. Davies Creek Mountain Bike Park played host to stage two. The hard-packed, fast and flowy single tracks were situated around an hour out of Cairns. This meant, we’d need to be organised! However, the day started with misadventures; we started with a poorly managed time schedule, which meant we piled into our Jucy Rental, searched the Google maps and pegged it to the start line, only to arrive 10mins late! The race announcers were calling the start; we kitted up and then embarked on our ride. Behind the field, we tried to make up some time. After around 30 minutes of riding we picked up some riders not racing so much as just stoked to be out there. There were a few characters and as we got chatting we dropped the need to be on a certain time, or even pick up the field. As the day went on we started to get into our groove; we were railing the berms, and pedalling the flat sections – hard. My legs were feeling great, and the bike was getting better. In and out of the saddle the SB100 climbed well, and it allowed me to accelerate over the top of the climbs and onto the singletrack sections. Clipping a tree with my bars in a tight singletrack section, I went down but bounced back up with a few grazes and a twisted bar. Pikey, said we should just roll to the finish line and I agreed. I could hear the announcer calling riders home; we must have been around a 1km away and then Pikey crashed, badly. He got up, but he was super ginger and his breathing was shallow. We suspected a broken rib and both crawled to the line. Instead of venturing back to the coast to drive up to Port Douglas, we decided to take the inland (more remote) route. After a pub lunch and repairing my cracked phone screen (from the crash), we rolled into Mount Molloy. The quant little Tablelands town had an old Queenslander Hotel and that was about it. We pulled in for a pot of XXXX and stretched our broken bodies. We had planned to stay in Port Douglas, but instead we asked for a room and had a night with the locals. Mount Molloy was on the cards for stage three. The 60km route would take us through two national parks. We munched some Weetbix, brewed some coffee and checked our broken bodies. As we headed out for the day, the pub owner said ”better you than me, but we will have a shower, toasties and beer waiting for you.” She then returned to her cigarette. Our broken bodies didn’t worry us too much as we tackled the longest stage of the race. This course offered a good mix of gravel, fire roads and technical trails with not too much climbing (which differed from the previous two stages). We rode back to the hotel for a wash, two toasties and a few pots of XXXX. We didn’t want to leave our newfound friends at Mount Molloy’s watering hole. The infamous bump track would be the final blast for stage four. We meandered our way to the start of the bump track. Earlier talk about the bump track, was that it should be respected and ridden with caution. Of course we took this on board, but were up for the challenge none the less. This was once an Aboriginal trail, linking the ocean to the mountain, now it serves as scenic 6km multi-purpose trail that leads you deep into the mountains and surrounding river beds. Riding with a buddy just meant we had rhythm, when one rider was fading the other was up and vice-versa. And, being in contact with each meant you could give each other a pep talk as and when required. It was great to see Pikey back on form for this stage, and although his rib was sore his spirits were high. His inner-strength made me stronger. The descent down was similar to a ski run. Loose tree litter and big water bars had me drifting and using all the suspension the SB100 had to offer. The bike isn’t big on travel, but it didn’t feel limited either; it was super playful and felt at home when the trail pointed down. This was by far the best track of the past few days. It helped that I was used to the bike and was nearing the end of the race. We rode out the bottom of the track in style (well, at least that’s what I thought). The final section took us along the white sand beach and you eventually finish up at the Port Douglas Life Saving Club. We high-fived each other, grabbed a beer and washed down the bikes and returned to my still overflowing inbox. Thanks to: Ironman, Jucy Rentals, Yeti NZ and the gold folk at Mount Molloy National Hotel. "Good mix of single track fire roads, a bit of climbing, a bit of descending, sets apart the mountain bikers from the roadies, beautiful weather. Two wheels in the air, arms flying having fun!" - Amy from Rotorua. 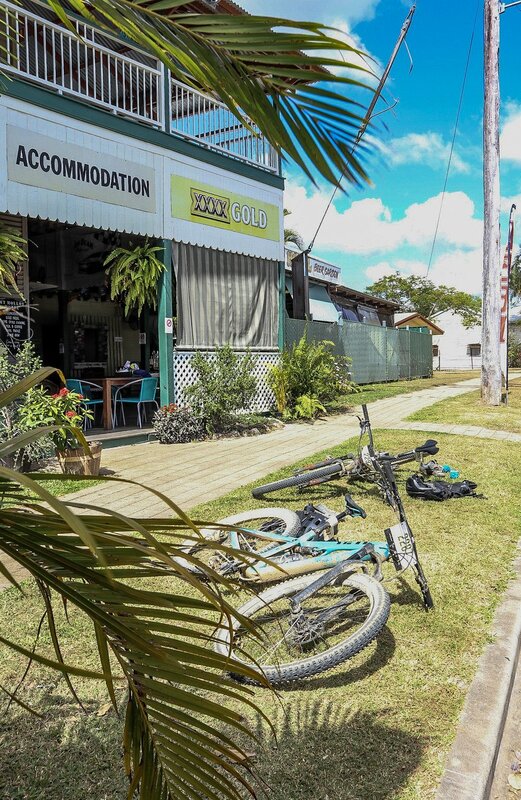 Rolling for 4 days through the heart of Tropical North Queensland, Reef to Reef offers massive riding variety. From UCI World Championship trails, rugged Aussie bush and heritage rainforest to a stunning palm-lined beach finish, it has it all. Add the fun of team racing for a cool, new experience. Tired? Your team mate can encourage you, draft you, even push you. Feeling strong? You can sit on the front, or drive the group, or try pushing. At the end of each stage, there's plenty of time to kick back with a brew and share a few trail tales with mates old and new.